The steeplechase preliminary round went according to plan to Ashley Higginson (Princeton ’10). In the first heat of the night, Higginson went to the front of the field at the gun and stayed among the top 4 throughout the race. She alternated leading responsibilities with Nicole Bush and Courtney Freriches during the race, but made sure she was in one of the three automatic spots on the final lap. Higginson finished third in her heat with a time of 9:42.18 behind Bridget Franek and Freriches, automatically advancing to Thursday’s final. Bush would advance to the final on time. Paige Kouba’s preliminary steeplechase race did not go to plan. The recent Harvard grad was in the second heat. Once the gun went off, the field almost immediately formed two packs as the speedsters that included Leah O’Connor, Stephanie Garcia, and Colleen Quigley went to the front while Kouba was in the back pack of five. O’Connor, Garcia, and Quigley began to gap the field, securing the automatic berths for the final by the middle of the race. Kouba – who signed with Saucony prior to the Trials – finished way outside of final qualification as she was 10th in her heat in a time of 10:13.82. Donn Cabral (Princeton ’12) took his time to get to the front in his preliminary heat in the steeplechase as he took the lead by the end of the fourth lap. By taking the lead, he picked up the pace in order to spread out the field and make the race honest (first 1km was 8:43). Cabral upped the acceleration at the sound of the bell on the final lap as he had Andy Bayer on his outside shoulder and Stanley Kebenei on his back. 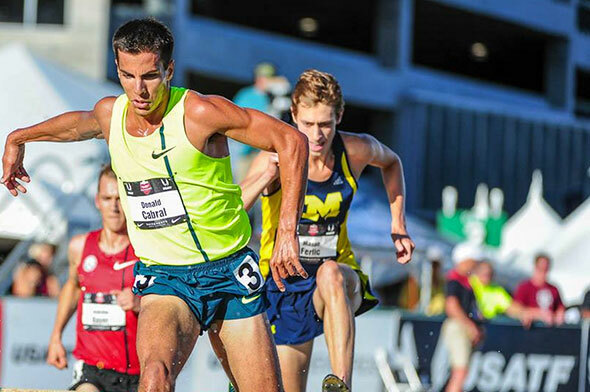 He was able to pull away from them after the final steeple as Cabral won the heat in 8:26.96. Cabral’s time ended up being the fastest time out of all of the preliminary heats. The steeplechase final will be held on Friday. This entry was posted on Monday, July 4th, 2016 at 7:28 pm. It is filed under Olympics, Spotlight. You can follow any responses to this entry through the RSS 2.0 feed.